Fairhill Road Village consists of thirteen buildings that gain significance from setting and architectural uniformity. The residential district straddles the boundary between Cleveland and Cleveland Heights approximately six miles east of downtown Cleveland, and 1-1/2 miles southeast of University Circle. An important feature of the development is its natural setting, with a ravine setting to the rear of the property. The district includes five semi-detached units and three one-family dwellings. The four structures along Fairhill Road have narrow setbacks of approximately ten feet. The units in the center of the development are grouped around a drive and a greenspace and along the ravine to the rear of the units. The units are orientated so that garages face the street with living rooms to the rear overlooking the ravine. Backyard privacy is maintained by stuccoed walls between each unit. Fairhill Development was built on a rock dump in Ambler Park which was created in 1915 as a result of the excavation for Fairmount Reservoir. The contractor was to clean up the dump but went bankrupt. The development was designed in an English Cotswold style to resemble an English hamlet. Varied details were important in conveying this sense of the English hamlet. The variety of window treatments include box bay windows, diamond shaped pane windows and casement windows. Pointed arch windows are found in gables. Chimneys are placed in the center of the single units. Chimneys are placed at the ends of the double units. There are a variety of gables which vary in size and treatment. Buildings in the development maintain an integrity of scale, setback and building materials that date to its date of origin. One building, 12501 Fairhill, would be considered an intrusion because of its 1971 construction date. This contemporary structure does respect the scale, massing, and setback of the older buildings in the development. · 12309 Fairhill, one family unit, built c. 1930. Architect unknown. · 12321-5 Fairhill, two family unit, built 1929. Architect unknown. · 12329-12403 Fairhill, two family unit, built in 1930. Architect: H.O. Fullerton, cost $20,000. · 12407-12411 Fairhill, two family unit, built 1930. Architect: H.O. Fullerton, cost $35,000. · 12415-12419 Fairhill, two family unit, built c. 1930. Architect unknown. · 12425-12427 Fairhill, two family unit, built c. 1930. Architect unknown. · 12501 Fairhill, one family unit, built 1971. Architect: Harlan E. Sherman, cost $150,000. This is a non-contributing building because of its recent construction. The stuoccoed exterior wall treatment is not consistent with the other buildings in the complex. · 12511 Fairhill, built c. 1936. Architect unknown. Original plans called for moving people from Cleveland’s Hessler Road neighborhood to Fairhill, according to an article in the April 1929 issue of Architectural Exhibitor. The purpose of the development was to keep people with kindered tastes together. This group of people included artists, interior decorators, architects, musicians and writers. City directories indicate that this did not occur; the original Fairhill residents came from several different Eastside neighborhoods. The landscaping for Fairhill Road Village was planned A. Donald Gray, who had been associated with Olmsted Brothers Landscape Architects early in his career. At the time Olmsted Brothers were reputed to be the finest landscape architects in the country. 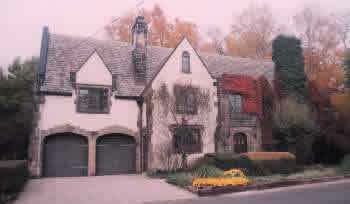 Gray is best known for landscaping the Horticultural Gardens at the Great Lakes Exposition (1936-37), some of the cultural gardens (1916-1939), and Forest Hills Subdivision (1925), Mr. Gray’s clients included Leonard Hanna, H.M. Hanna Jr., Charles Brush, the Sleepy Hollow Country Club, Cleveland Clinic, and the Public Auditorium for the city of Cleveland. Fairhill Village landscaping took advantage of a flat irregular site overlooking Ambler Park Ravine. The densely wooded ravine provides direct access to nature from the back of the units. Patios and living rooms to the rear of the units were planned to take advantage of this natural feature. Landscaping, plantings, trees, and shrubs were kept to evergreens abutting the buildings. Plantings are also used to provide a sense of privacy by screening patios. Architect Antonio DiNardo designed the original concept of Fairhill Village. DiNardo had worked in the office of Paul Cret and later Arnold Brunner, architect of the old Federal Building in Cleveland. Upon arriving in Cleveland in 1921 he worked in the office of Hubbel and Benes, where he designed the Pearl Street Bank. In business by himself he designed St. Augustine Academy in Lakewood, St. Margaret of Hungary on Buckeye Road in Cleveland, St. Augustine Church in Baberton, and St. Cecilia Church in Detroit. Originally part of the group that planned Fairhill Village, DiNardo resigned in July 1929. He was replaced by architect Harold O. Fullerton. Landscape architect A. Donald Gray and architect Harold O. Fullerton were early residents of the village. Rowena and Russell Jelliffe, founders of Karamu House (a settlement house nationally known for its dedication to inter-racial theatre) were also residents of the village. Other prominent residents of Fairhill were: Newton D. Baker III, son of the Mayor of Cleveland; Avery Sterner, Secretary-Treasurer of Speed Kind Cordless Iron; Jon T. Stever, President of S.K. Wellman Company.